Versatility means everything in football. Being a player that can assume multiple roles and attack from anywhere on the field at the safety position can keep offensive coordinators up the whole night before a game. We saw it in the 2018 NFL Draft with Minkah Fitzpatrick, arguably the most versatile defender in the draft, being drafted at number 11 overall to the Miami Dolphins. Fitzpatrick’s ability to play nickel, deep safety and both man and zone coverage made him a hot commodity last April. But where he separated himself from the pack was when he would slide down into the box to help defend the run or rush the passer. 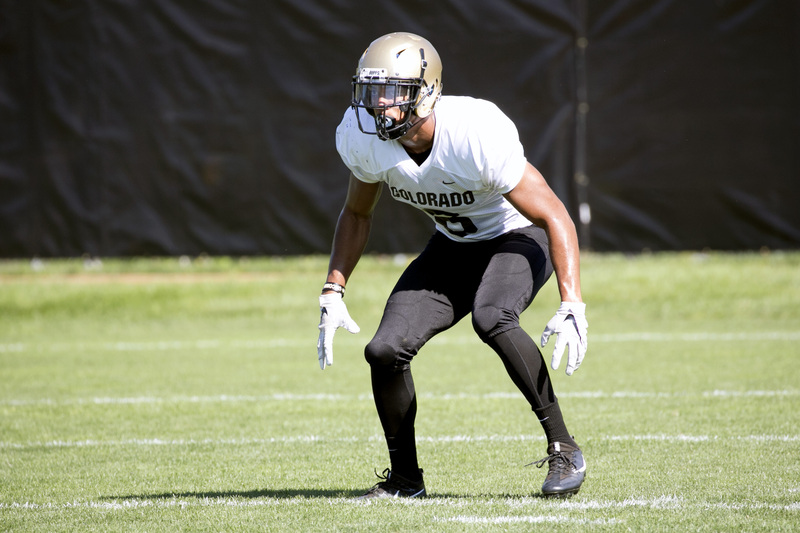 Colorado’s Evan Worthington is a player I have my eyes on to be one of the next swiss-army-knife-DBs to showcase his versatility to NFL scouts and NFL Draft enthusiasts this fall. Now I’m not expecting him to be a top 15 pick come April 2019, but Worthington shows the tools to be a problem for offenses this year in college and potentially appear on draft boards in the spring. Worthington spent 2016 away from the team while serving a year long suspension for violating team rules. As a junior in 2017, Worthington rejoined the team and the defense immediately welcomed his presence, as he finished third on the team in total tackles (86), first in solo tackles (66), and first in interceptions (3) along with seven pass breakups. He is a prime candidate to break out on the national scene as a senior in 2018. Man coverage is one of the strengths of Worthington’s game due to his speed and ability to quickly flip his hips and remain glued to a receiver. Colorado loves to have Worthington play nickel, especially in man to man situations. Worthington’s speed is showcased here on this play. He is a bit late in turning his hips and bailing, but his speed is very good and he’s able to quickly catch up to the receiver and help contribute to the defense’s coverage sack. Due to Worthington’s length and strength, he matches up well with tight ends. This ball is a bit overthrown, but Worthington is able to meet the TE at the top of his jump and make sure that there is no completion on the play. When it comes to zone coverage, Worthington is still raw. He gets caught looking in the backfield from time to time and can be beat deep when playing the deep middle of the field. Because of his speed, though, he is able to make some plays even while out of position to save some big plays. Colorado is running a Cover 3 zone defense when CB Dante Wigley (#4) blows his deep third zone. Worthington is able to flip his hips, use his speed and ends up covering for Wigley’s mistake. Worthington is playing deep centerfield here, with man coverage underneath him, and picks off Josh Rosen (#3). It’s not the toughest read for a safety due to bootleg action and Rosen staring down his target. Still, Worthington isn’t fooled by the play action, reads the quarterback to successfully locate and pick off the pass. As with any defensive position, tackling is crucial. It’s a trait that is usually stressed more with safeties since they are the last line of defense and need to prevent big plays and touchdowns. Worthington is a good tackler overall and can make some pretty impressive stops due to his speed and strength. Starting the play in the dead center of the field on the 50-yard-line, Worthington is able to cover quite a bit of ground, break down, and make a play to force a 4th down after a good completion. One of my favorite highlights of Worthington. He recognizes Ronald Jones (#25) motioning from his RB position to the field, and because of his strength and reach is able to push back the WR blocking him and make a one handed touchdown saving tackle on Jones. Listed at 6’2” 200 lbs in 2017, his length, size, and speed allows him to matchup with tight ends, backs, and wide receivers. Not only that, Worthington shows a willingness to drop down into the box and help against the run, even acting as the edge defender in some situations. In 2017 Worthington started two games for the Buffaloes at “buffback”, the name for their hybrid safety/linebacker position. Here he is diagnosing the run, clamping down on the edge, and crashing the critical block on a G Power. Ronald Jones (#25) has no choice but to try and cut back away from the point of attack. This was one of the handful of times Colorado was able to hold Ronald Jones in check. Worthington is brought across the formation due to motion from the tight end, passes the TE on to a teammate, then diagnoses and blasts through the hole, resulting in a negative play for UCLA. Colorado is giving Cal a two high, man to man look pre snap. Worthington does a great job not tipping his hand before the snap and uses his speed to get around the corner and get the sack on the quarterback. There are some impressive traits that show in Evan Worthington’s game but there are also some inconsistencies. His speed is easily noticeable, but he can get himself into trouble relying on it too much at times. Zone coverage is where Worthington needs to make the most improvement. If he can steer clear of trouble and stay on the field, I can see Worthington improving in this area as he becomes more experienced. While he is a good, and for the most part reliable, tackler he does have room to improve. One area I noticed is struggling to get his head in position and across the ball carrier in order to finish more tackles. I’d also like to see him become more of a technician when it comes to man and zone coverage. His hips are nice and fluid but his footwork leaves much to be desired. The good news is all these things can be coached into a player and are learned over time with more reps and games under his belt. Worthington had a great year coming back into the fold in 2017, let’s see if he can take the next step and be a name we are all familiar with when draft season rolls around. Follow Jake on Twitter @JakeSchwanitz.